For November we have 5 tours lined up, including three new guides and themes. Join Allen Mawer for a leisurely walk around ‘Old Old Acton,’ stopping to admire photographs from the past contrasted with the current vistas. Jeanette Brand from the ANU Drill Hall Gallery will lead us on a private tour of the new exhibition Dadang Christanto: Wounds in our heart, and in the first of our planned sustainability tours, ANUgreen Intern Jasmin will guide us around a small selection of the ANU sustainability initiatives. Back by popular demand (after the last tour was booked out), Bradley Cummings will lead a photography tour capturing the arts and architecture at NewActon, And this month, David Williams will share his insights into the artists and their works at the ANU International Sculpture Park. Please remember to BOOK for these tours, as numbers are limited for many. 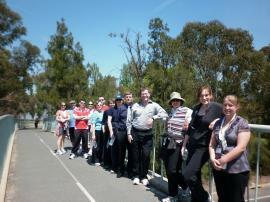 To book, email us at info@actonwalkways.com, via our 'Contact us' page, or phone 0437 301 390.